On Friday, I typed “The End” at the bottom of the last page of my latest book, Firebrandt’s Legacy. The book collects previously published stories of a space pirate captain named Ellison Firebrandt and his crew and adds some new stories to create what amounts to a “fix-up novel.” Each chapter is a short story, but the whole thing forms a complete story arc. Now these chapters are likely to get tweaked as beta readers and my editor work their way through it, but your support will help me pay cover artist Laura Givens and help pay the costs of editing and typesetting the book. What’s more, to show my appreciation, I plan to share a gift code with my patrons that will allow them to download the complete book once finished. I’ve also adjusted my Patreon goals. One of those goals is that with sufficient support, I can make this blog ad free. As it turns out, I finished this book the day after I received news that I had been promoted from “Observing Associate” at Kitt Peak National Observatory to “Senior Observing Associate.” In essence, the promotion recognizes my seniority at the observatory plus the work I’ve been doing with the on-line manuals for my fellow operations’ staff. These moments coming together do cause me to reflect on where I’ve been and where I’m going. I worked in astronomy full time from 1990 until 2000. At which point, I decided to devote myself to writing and editing full time. I did that until 2008 when staff members at Kitt Peak asked me if I wanted to return. I agreed under the provision that writing was recognized as my primary career. So far, my supervisors have been very supportive of this. I also returned because I feel astronomy is a way that I contribute to the larger body of human knowledge. 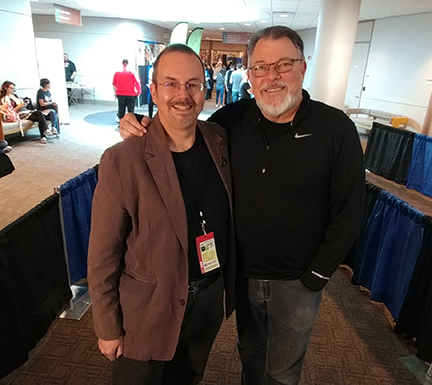 My position as an astronomer and a writer allows me to communicate some of what we learn to the public through appearances at conventions and through this blog. This broader support mission is not part of my job, though, it’s supported through sales of my books and Patreon supporters. My schedule at the observatory is not all that flexible, it involves working long nights, and those nights often require full concentration. My pay is pretty good for living in the southwest, but even with the most recent raise, it’s still below the average salary in the US according the Census Bureau. I note this just to point out that despite my full-time job, I’m not a well-to-do hobbyist. I do need support from sources like book sales and Patreon to continue publishing and to afford travel to events. So, looking ahead, I’ll spend this fall polishing Firebrandt’s Legacy for publication. I’m scheduled to appear at several events including Bubonicon in Albuquerque, CoKoCon in Phoenix, TusCon in Tucson plus I’ll be signing books next month at a local bookstore. More about each of those soon. I’m also working on some projects that I can’t discuss yet and am not entirely sure when I’ll be able to announce them or whether they’ll bear fruit at all. I say this less to tease you and more to say I am working on things in the background. In the meantime, as I announced on July 21, after Firebrandt’s Legacy is complete, I do plan to turn my attention to a new edition of The Pirates of Sufiro, which was my very first novel. In a way, “The End” on Firebrandt’s Legacy has caused me to spiral back to the first book I wrote and I hope to take what I’ve learned on life’s journey so far and make it an even better book. Whether it’s through my books, appearances at conventions, Patreon, the web journal or some combination, I hope you’ll come along with me for this exciting journey. 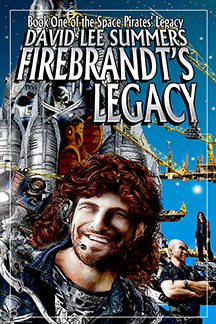 I’m currently working on the final chapters of my collection Firebrandt’s Legacy. This book collects space pirate stories that have appeared in numerous anthologies over the years alongside several new stories. The whole collection is an arc of related stories, so the book may be read as an episodic novel. I’ve been sharing the new and revised stories with my Patreon subscribers since September 2017. Based on my current outline, I have about three stories to go to bring events up to the beginning of my novel The Pirates of Sufiro and to bring the collection up to the length I want. I will release the first story of the final three to my Patreon subscribers on Thursday, July 26. My approach to Patreon has been pretty simple. I only have one tier and it only costs $1.00 per month to subscribe. Of course, patrons are welcome to pay more per month if they feel sufficiently moved by my work to support me at a higher level. My first goal is to use this money to pay the costs associated with publishing Firebrandt’s Legacy. My second goal is to print new editions of the other related books including The Pirates of Sufiro, Children of the Old Stars, and Heirs of the New Earth. Patreon support has already helped me publish the new edition of The Solar Sea, which is a prequel to my Space Pirates’ Legacy series that tells the story of how humans became a space faring society. I shared a free download of the ebook with all my Patreon subscribers. Patreon support also helps support this blog and helps support my travel to conventions where I give both writing and science presentations. For the duration of Firebrandt’s Legacy, I have been posting at least one new or revised story to the site per month along with a “Behind the Scenes” look at where the story first appeared (if it had been previously published) and what influenced me to write the story. Of course, I plan to share a free download of the complete ebook to all my Patreon subscribers when it’s complete. Now that I’m about to finish Firebrandt’s Legacy, I’m thinking about the best way to share my progress revising The Pirates of Sufiro for a new edition. I expect that I’ll be heavily revising this novel for a number of reasons. Not the least of which is that this was my very first novel and I’ve learned a lot since I first published it. I’ve also received a lot of feedback on the novel over the years and plan to take those comments into account. Sharing “reedited chapters” may not sound like much value to anyone who has already read the book and people may wonder why they should subscribe instead of just buying a cheap used copy of the book. My current plan is that when I start The Pirates of Sufiro, instead of doing the “Behind the Scenes” segments, I’ll share the chapter as it appeared in the most recent edition, perhaps along with some notes about the inspirations and the origins of the ideas. I’ll wait a couple of weeks, then present the revised chapter, so people can see what I’m doing with this edit. In both cases, I’m delighted for people to comment on what I’m doing as the project progresses. One last thing before signing off. 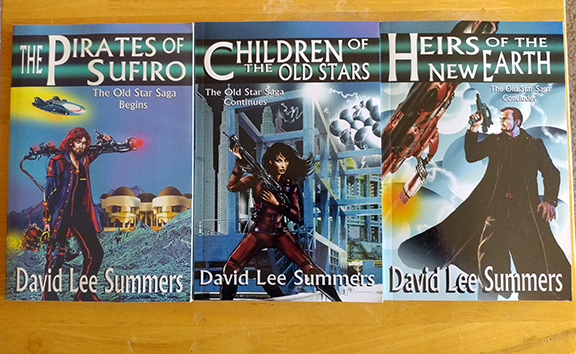 Speaking of used copies of The Pirates of Sufiro, Children of the Old Stars, and Heirs of the New Earth, Hadrosaur Productions is running an auction at eBay for the last complete set of the LBF/Hadrosaur editions of the Old Star Saga in their stock. Drop by and place a bid at eBay! While learning more about the movie The Extraordinary Adventures of Adèle Blanc-Sec directed by Luc Besson and the comic of the same name by Jacques Tardi, I stumbled across another French comic which was recently adapted by Besson. 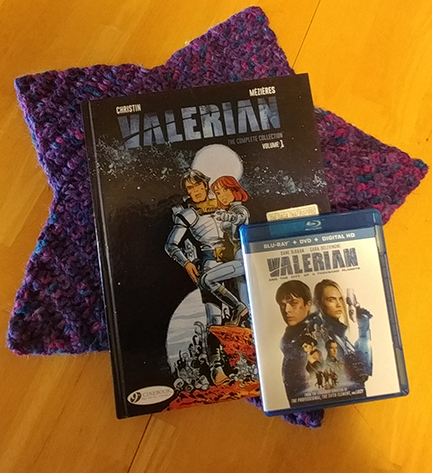 The comic is Valérian and Laureline written by Pierre Christin and illustrated by Jean-Claude Mézières. The movie, called Valerian and the City of a Thousand Planets, completely slipped under my radar. Because I love a good space opera, I immediately set out to see the movie and read some issues of the comic. The comic started its run in November 1967. To put it in context, the original Star Trek was still on the air in the United States and Patrick Troughton was playing the title character of Doctor Who in England. It’s pure pulp action Sci Fi, reminding me most of Buck Rogers with a touch of Flash Gordon thrown in for good measure. The artwork, particularly in the first two installments, looks like it’s inspired by Mad Magazine and there is a definite satirical edge to the stories. The characters of Valérian and Laureline also remind me a little of Jamie and Zoe, the Doctor’s traveling companions at the time, but with some of their personality traits mixed up. Laureline, like Jamie McCrimmon, is from the past and doesn’t always want to follow the rules. Valérian, like Zoe, thinks highly of himself, and seems to need rescuing from time to time. I’m not convinced these similarities are deliberate. I suspect there’s an element of the zeitgeist of the period in these passing resemblances. Fans of Valérian and Laureline are also fast to point out many similarities between the French comic and Star Wars which would come out a decade later. I gather George Lucas has acknowledged the French comic’s influence on the look of his world. Jumping ahead to the movie, I thought Valerian and the City of a Thousand Planets was a gem. It captured the spirit of the comic very well and I thought presented a dandy and cohesive story with some cool science fictional ideas that made valid commentary on what can happen when indigenous peoples find themselves caught between two civilizations at war. Valerian and Laureline themselves are introduced during a special ops mission at a market that exists in a different dimension from our own. I loved the way that concept was portrayed on screen. I enjoyed the performances of Dane DeHaan as Valerian and Cara Delevingne as Laureline. They’re not your usual Hollywood romantic couple. In fact, they seemed just a little uncomfortable with this whole romance thing, but it worked for me because that’s the way romance often works in real life. It’s figuring out how you each work, and not having the writer put phrases in your mouth that the other party has to be a moron to misunderstand and pout about until they make up. The film also features a truly outstanding performance by Rihanna as an alien called Bubble. I also loved the cameos by Ethan Hawke and Rutger Hauer. As a bonus, I’ve discovered that about ten years ago, Valerian and Laureline was turned into a French-Japanese co-produced anime. From what I’ve seen so far, the anime’s story diverges from the comic’s, but it still looks fun. I definitely need to watch a few more episodes.